If you've heard anything about The Starship Damrey, it's probably that it doesn't last long. And it doesn't--my playthrough ended just short of the four-hour mark, while I've heard others have reached the game's credit roll just two-and-a-half hours after they started it. Some people will tell you The Starship Damrey isn't worth buying because of its brevity. I'm not one of them. In fact, I think that in a world of 100-hour behemoths like Dragon Quest VII, this game's curtness should be looked at as a major selling point. It helps, of course, that I purchased The Starship Damrey for a measly $2.99. (It's usually $7.99.) Still, considering this Level-5 release is at least as long as, and easily as compelling as, your average popcorn flick, I'd say it's well worth eight bucks, if that's what you have to pay to get it. As for what makes The Starship Damrey so compelling, well, its setting--a derelict spaceship that calls to mind those depicted in the Alien and Aliens films--has a lot to do with it. 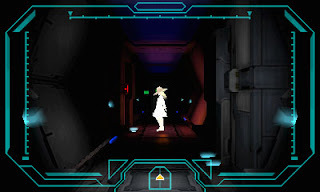 Even better, the game begins with you waking up trapped inside a "Cold Sleep" capsule within the above-mentioned ship. And on top of that, it offers no explanation as to why you're there or what you're supposed to do to escape it. From that point on, it's up to you to solve those mysteries by making use of the handful of "Assist Robots" situated throughout the craft and having them prowl its nearly silent interiors in your stead. Thankfully, exploring Damrey's halls--from a first-person perspective, if the screens here don't make it clear--is both easy and intuitive. Your 3DS' directional pad controls movement (press up to go forward, right to turn in that direction, etc. 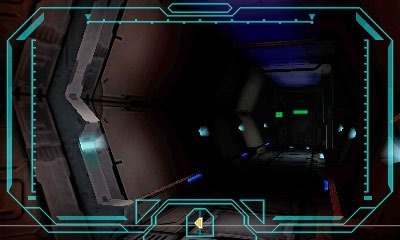 ), while its circle pad controls the camera. A press of the system's face buttons lets you interact with or investigate items in your path or field of view, like doors, bodies or other objects of interest. It has to be noted, by the way, that you do all of the above while basically fumbling around in the dark. You also do it in almost complete silence. 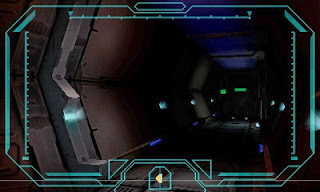 Some ambient noise, as opposed to an actual soundtrack, accompanies your journey through the Starship Damrey's claustrophobic innards, but only a smidgen. Both aspects are sure to cause a certain percentage of players to wrinkle their noses in disgust--or at least annoyance. Although I'd understand such a reaction (to a point), I personally thought those design decisions helped solidify the sense of desolation and even dread that permeated my Starship Damrey playthrough. In the end, I'd highly recommend this title, made by text-based-adventure pioneers Kazuya Asano and Takemaru Abiko, to anyone who doesn't consider first-person games set it dark, quiet and semi-claustrophobic environments to be deal-breaking turnoffs. Just do your best to overcome any stumbling blocks without turning to a guide or an FAQ for assistance. After all, if you're only going to spend a couple of hours with a game, you may as well beat it on your own, right? 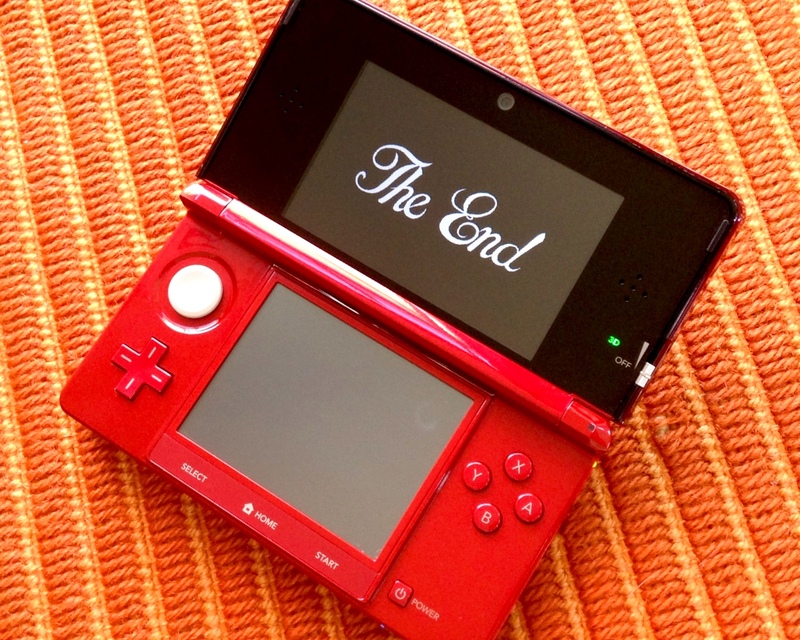 Anyone who has played through either the PlayStation or the 3DS version of Dragon Quest VII knows it's a long game. A really long game. In fact, it isn't unusual for people playing either iteration of this JRPG to put more than 100 hours into it before they encounter its credit roll. Still, I'm glad I bought and played it. And I'm glad I kept at it until Orgodemir (that's the name of Dragon Quest VII's main baddie) was dead and buried. I had a surprisingly good time with the last few hours of my Dragon Quest VII journey, by the way (a stark contrast to the early part of my playthrough), and I found the aforementioned last battle to be the perfectly challenging cherry on top of this polygonal sundae of a game. I can't say I was entirely pleased when it dawned on me that Dragon Quest VII's ending wasn't going to be a straightforward affair. All I wanted was a few congratulatory scenes and a credit roll. Instead, I had to take my party members on a "victory tour" that lasted at least 30 minutes. To be fair, I would've been a lot more OK with that if I'd been home at the time. Instead, I was in the car (don't worry, I was a passenger) with a 3DS that desperately needed to be charged. Thankfully, my 3DS didn't die on me, so I was able to enjoy the second half of Dragon Quest VII's finale after I returned home. I even beat Orgodemir a second time this morning--with a slightly different party (my first attempt consisted of the hero, Aishe, Maribel and Ruff, while I swapped out Maribel for Melvin during the second)--just so I could take the photo that appears above. With Orgodemir finally out of the way, I'm going to move on. 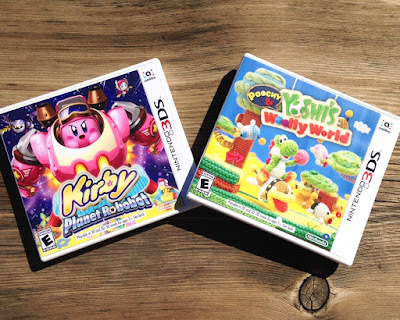 Specifically, I'm going to move on to the 3DS games showcased in the snapshot above--Kirby: Planet Robobot and Poochy & Yoshi's Woolly World. I'm also planning to devote some quality time to Pop Cutie! for the DS--it is #FashionGameFeb, after all--as well as the Vita release of Dragon Quest Builders. I'll share my thoughts on each of these titles in an upcoming post (probably in a "Shall We Do It?" write-up) or two, so keep your eye out for them. Also keep your eye out for my inevitable review of Dragon Quest VII. In the meantime, feel free to share your own thoughts on the Dragon Quest VII 3DS remake in the comments section below. Or let me know which games you're playing (and hopefully enjoying) at the moment.